March 16, 2018 2:18pm EDT March 16, 2018 2:18pm EDT American Football, Vontaze Burfict, Cincinnati Bengals, English, NFL Bengals linebacker Vontaze Burfict reportedly is facing a four-game suspension for violating the NFL's performance-enhancing drug policy. Bengals linebacker Vontaze Burfict is facing a four-game suspension for violating the NFL's performance-enhancing drug policy, ESPN reports. Burfict isn't a stranger to suspensions, but this is the first time he faces missing games because of PEDs. 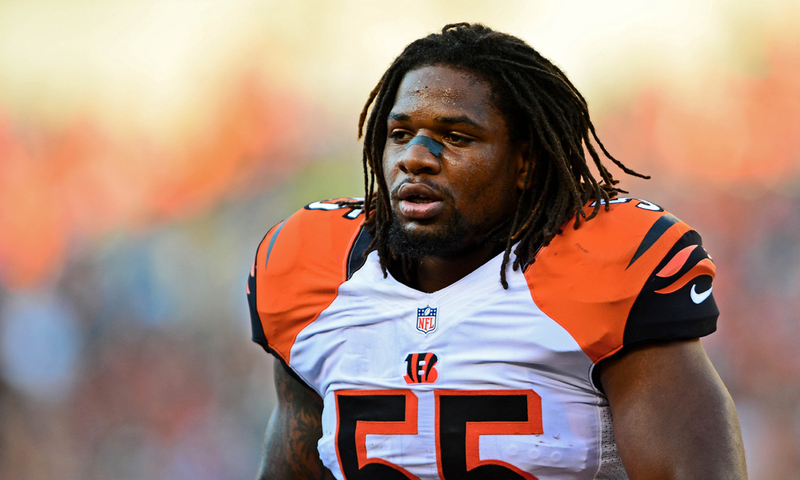 The report also indicated Burfict is expected to appeal, but a date for that has not been set yet. The 27-year-old has been suspended previously for violating the NFL's player safety rules, including a three-game suspension (reduced from five on appeal) after a hit in preseason on Chiefs fullback Anthony Sherman. He signed a three-year extension worth $38.7 million last September, but he played just 10 games last year as a result of injuries and suspensions. Lagarette Blount to the Lions. Michael Crabtree to the Ravens. Sheldon Richardson to the Vikings. BREAKING NEWS - the Jets have moved up to 3rd in the draft in a trade with the Colts. Pittsburgh agreed to terms on Sunday with free-agent linebacker Jon Bostic on a two-year deal. This is Pittsburgh's first signing of free agency. The cap-strapped Steelers released secondary members William Gay, Mike Mitchell and Robert Golden earlier this week. Maybe the Colts are trading down to get OL help. Quinton Nelson would be a great fit for them. What do you think? GB's defense hasn't been a world-beater with Burnett. Is he really an upgrade on the back end? I'm not familiar with Burnett, I hope he's a good fit. Wonder what phunkdaddy thinks about this move? They better.....their lack of attention to the o-line got their franchise QB fucked up. solution. Just a veteran with experience so you don't have to throw a rookie into the fire. don't do high profile pricey free agent shopping at all. With the signing of LB Jon Bostic and Burnett you've addressed an area of need(not long term) but you've added experience there and now it allows you to gamble and take the best athlete available in 2nd or 3rd round of draft regardless of position. Giants make some serious noise with the JPP trade. Yeah, I can't think of another situation where a team managed a franchise QB, and a potentially elite one at that, so poorly. In 2014, they traded a FIRST-round draft pick for Trent Richardson. That tells you all you need to know about their front office. Possibly. They've got a lot of FAs to sell tickets and compete now, but they'll need them work into their systems. Suh, Marcus Peters and Aqib Talib are volatile personalities. They need Goff to continue to grow as well. That said, Suh has played alongside some DL talents before, but no one in Aaron Donald's realm. Those two are going to be hard to stop, on paper or the field, and the other 9 guys will benefit in so many ways from that tandem. I have a sinking feeling OBJ will get traded before the draft.